Wetlands encompass a diversity of habitats that rely on the presence of water to survive. Over the last two centuries, these hard-to-reach areas have been viewed with disdain or eliminated by a public that saw them only as dangerous and worthless lowlands. 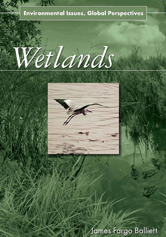 Wetlands provides case studies that illuminate our changing perceptions of one of the world's richest and biologically productive biomes, including the Florida Everglades, the Aral Sea in Central Asia, and Lake Poyong in China. It also highlights efforts that have been undertaken to protect many of these areas.